This match just won’t leave my mind. As you know, I decided to do a LiveAnalysis post for this momentous semifinal (which you can be find here), and by the end, I was absolutely drained. Of energy, and of words. I was so wiped out, and I just typed on my keyboard while sitting in my living room – Rafael Nadal and Novak Djokovic played their heart out on Philippe Chatrier for over 4.5 hours in one of their traditionally brutal physical contests. 1. I keep coming back to this point: even though Novak Djokovic seemed emotionally flat during stretches of the first three sets, and to my taste used the wrong tactical gameplan (more on this later) for most of the match, he somehow was up a break on Rafael Nadal in the fifth set at Roland Garros. That’s just remarkable. How did this happen? One big reason is that Djokovic executed his chosen gameplan at a high-enough level that it masked the overall problems with said strategy. 2. Rafael Nadal’s tenacity in the fifth set, after the heartbreak of having served for the match in the fourth and failing to finish the job, was simply otherworldly. Not only that, but as the Spaniard quickly went down a break (and remained behind in the scoreboard all the way until 4-3 in that deciding set), he still kept fighting like a maniac. The all-time great from Manacor simply refused to go through another harrowing loss to Djokovic like the one he had to endure at the 2012 Australian Open final. I hope every aspiring junior in the world saw that fifth set: that’s how you fight on a tennis court. 3. Djokovic and Nadal have yet to put together a thoroughly excellent 5-setter. There are always highs and lows during their lengthy matches, but what they do achieve sometimes is to play fantastic sets of tennis. At the 2011 US Open final, it was the third set. At the 2012 Australian Open, it was the fourth. Today it was the fifth, which not only was full of ridiculous shotmaking, but also of enormous drama. I just couldn’t understand how both men were pulling out these seemingly impossible shots…after four sets of grueling tennis had already gone by. – Why give Nadal a chance to hit one of his favorite shots? – Why put yourself in a position where you have to consistently hit low-percentage shots…in a best-of-five match? What I found fascinating was that this wasn’t even the first time Djokovic employed such a gameplan: back in the early years of this great rivalry, the exuberant and inexperienced version of the current 6-time Slam champ often resorted to that sort of strategy on clay, and it bore him no success at all: Djokovic would claim his first clay win over Nadal in 2011, and by that time, the clay head-to-head was 9-0 in Nadal’s favor. Why did Djokovic resort to this old, unsuccessful gamplan, then? On the surface, it makes no sense. The element of surprise? Some observation about Nadal’s movement having deteriorated when he moves to that side of the court? It’s particularly baffling given how well Djokovic used his more successful 2011 gameplan in Monte Carlo this year to great success. So here’s one explanation: the switch was done out of necessity, because Djokovic’s backhand down the line, an essential part of the 2011 gameplan, was far from reliable today. I wonder if the shoulder injury that’s been reportedly affecting Novak in the past few weeks has disrupted his pristine timing on that shot. Let’s remember that hitting a down-the-line shot presents two problems: you’re hitting over the highest part of the net, and your timing has to be perfect, given that you are changing the direction of the ball. The shot simply won’t work if there’s something that’s disturbing the swing. Again, this is just me theorizing. 5. One pattern I’ve noticed this year in Djokovic has been the surprising number of backhand unforced errors in big matches. The Serb’s two-hander is arguably the best in the business, and it’s the bedrock upon which his entire game is built on. But I’ve seen him leak unforced errors off that wing in plenty of big matches this year. The Del Potro semifinal loss at Indian Wells comes to mind. Today Djokovic ended with 28 forehand unforced errors, which is fine – that’s the shot he uses to be aggressive most of the time. However, Djokovic finished with just one fewer backhand unforced error (27). Compare that to Rafael Nadal, who finished with 20 forehand UFEs (again, a normal number), but just 13 backhand UFEs. Why is this happening? I have no idea. But Djokovic does have a history of having parts of his game deteriorate due to a problematic combo of bad habits creeping in and niggling injuries affecting those motions. His serve and his forehand famously abandoned him for long stretches of 2009 and 2010. Back then, it was Djokovic’s two-hander that held down the fort. Today, Djokovic’s serve and forehand are back on track…but the backhand seems to be having more problems than usual. Particularly the backhand down the line mentioned above, which is allegedly Djokovic’s favorite shot, and one that is a vital part of his baseline arsenal. It’s also the shot that tips the balance in his duels with the other members of the big 3: none of them hit that shot better than Djokovic. But as we saw today, Djokovic’s backhand down the line was mostly M.I.A. And to think that despite this, the World No. 1 was up a break in the fifth set. – 15 more points were played on Djokovic’s serve than Nadal’s serve. An indication of how Rafael was consistently managing to get into Djokovic service games more often than the other way around. – Nadal won 17 more return points than Djokovic (69 to 52). And the discrepancy comes from 1st serve return points won: Nadal won 13 more points returning Djokovic’s 1st serve than the Serb won returning the Spaniard’s main delivery (42 to 29). The difference with points on 2nd serve returns is much smaller: just 4 (27 to 23). – Nadal also had 10 fewer return unforced errors. Not a small number at all. This trend reversal is pivotal in explaining why this was a relatively lopsided 9-7-in-the-fifth match. One of the key elements in Djokovic’s arsenal against Nadal has been the ability to put Nadal through hell during most of the Spaniard’s serving games. Not so today: Nadal faced his first break point of the match in the second set. Overall, Nadal created 16 break chances (converted 8), while Djokovic created just 9 (and converted 5). Nadal also won the consistency battle: Djokovic won only 28% of his total points via Nadal unforced errors. On the other hand, Nadal won 42% of his total points via Djokovic miscues. And Nadal finished with 7 more winners than Djokovic, which makes the UFE disparity that much more important. Nadal also won 19 more points than Djokovic (the set-by-set breakdown is as follows: +6 for Nadal in the 1st, +5 for Djokovic in the 2nd, +16 for Nadal in the 3rd, +5 for Djokovic in the 4th, and +7 for Nadal in the 5th). – I couldn’t help but remember the 2008 Wimbledon final between Roger Federer and Rafael Nadal. Of course, today’s match didn’t remind me of that famed classic because of the quality of play. Rather, what I remember most from that epic Wimbledon match was that Rafael Nadal should’ve won in straight sets. And even after getting tight in the third set (he had triple break point at 3-all), he definitely should’ve won in four sets. As it turned out, Nadal had to win that match 9-7 in the fifth. Today was quite similar. Nadal was up a break in sets 1 through 4. In fact, he seemed well on his way to an anti-climactic straight set win once he went up a break in the second set. Djokovic’s resurgence was impressive, but Nadal wasn’t sharp enough to stem the tide. Then in set 4, as we know, Nadal served for the match at 6-5, and was up 30-15 in that game before unravelling. The only difference with the 2008 Wimbledon final was that Nadal was never down a break in that fifth set. Today he was, but still managed to win the whole thing by that identical 9-7 score. – This seemed like a mirror-image of the 2012 Australian Open final. That match was also significantly better, but it had some interesting parallels: Djokovic seemed well on his way to a 4 set win, but lost the fourth set in a tiebreaker. What’s more, he went down a break to Nadal in the fifth, and was down 4-2. Nadal then missed a routine backhand putaway, got broken, and Djokovic won the match 7-5. Today Djokovic was up 4-3, and had what appeared to be a simple smash at net. He lost his balance, however, and ended up touching the net well before the ball he had just hit bounced on Nadal’s side of the court for a second time. Nadal’s mistake in Australia came at 30-15: a correctly executed shot would’ve given him double-game point for a 5-2 lead. Today, Djokovic’s mistake/slip came at Deuce. Had he not run into the net, he would’ve had game point for a 5-3 lead. The World No. 1 didn’t get broken on the ensuing break point, though: like Nadal in Australia, the key break came two points later. As always, tennis is very, very weird. 8. I tweeted it at the time, and I’ll say it again: this was the strangest Djokovic-Nadal match that I’ve ever seen…and I’ve only missed one out of the 35 that are already in the books (I couldn’t watch the 2007 Wimby semifinal due to work). It was just impossible to predict. Djokovic looked done and dusted after just a set and a half, then after three sets, and then at 6-5 in the fourth. Each Houdini-like resurgence felt surreal, somehow (even though I’m well aware of Djokovic’s previous great escapes). I’m not even sure I can fully describe why it is that today’s match felt strange. I’m not sure if it was the atmosphere, or the fact that I watched it with no sound at all (I prefer most commentators, no matter how bad they are, over silence, but Johnny Mac was reaching new levels of nonsense, so muting became a necessity). I don’t know. It just felt bizarre. 9. Last week, when the news broke out that Jelena Gencic, the woman who had spotted Djokovic as an extremely promising six year-old, had passed away, I immediately knew that Novak’s French Open run wouldn’t have a happy ending. Marian Vajda, Novak’s coach, tried to do his job and squeeze some motivation out of the most unfortunate circumstance, but even as I read his thoughts about how this would probably help Djokovic keep his focus on the task at hand, it all sounded like benevolent wishful thinking. In his next match after learning about Gencic’s passing, Djokovic struggled his way through most of a seemingly routine 4-set win against Phillipe Kohlschreiber. No problem, right? Wrong. In a sport where so much is determined by what’s going on between the ears of the pros, receiving such a devastating blow has to take a toll. On Twitter, I compared it to an injury: it came out of nowhere, it was out of Djokovic’s control. But it’s a devastating blow, nonetheless. Now, here’s the thing: the reason I was convinced Djokovic’s run was destined for heartbreak was because I knew Rafael Nadal would be waiting in the semis. And against a player of that caliber, at an event the Spaniard has dominated so thoroughly, you need to have your emotional tank full. Again, Djokovic got through Kohlschreiber and then Haas without much problem. And if he had played anyone other than Nadal today, he would’ve been fine. Just as it happened in Monte Carlo last year, when Djokovic learned of his beloved grandfather’s passing, Novak pulled through all the way to the finals…where it was fairly evident that he wasn’t going to survive a focused Nadal who was hungry for revenge. The emotional tank was empty. I also found that the idea that Djokovic would somehow win the trophy in her honor was way more problematic than it seemed, for a simple reason: it adds pressure to an already pressurized situation. Djokovic had already stated that the French Open was his main priority this year, well before Gencic passed away. By trying to “do it for her,” Djokovic might have made himself vulnerable to troublesome thoughts when things weren’t going his way. The fear of disappointing the memory of such a crucial figure in his life, a “second mother,” indeed, cannot possibly help but add tension and desperation in adversity. And yet…Novak Djokovic was up a break in the fifth set, and two points away from a 5-3 lead in said set. So there’s that. 10. I’ve written this before, and I’ll write it again: Rafael Nadal is the greatest tennis player I’ve ever seen. Nobody competes like him. Nobody problem-solves like him. Nobody finds ways to win big matches quite like him. And that, to me, is what tennis is all about: not an aesthetic festival, but a mental and physical challenge. Nadal is the greatest competitor I’ve ever seen in any sport. Better than Jordan. Better than Derek Jeter. Better than Tom Brady. Better than Bird and Magic. Better than all of them. Words fail. Thank You For Valuable Insight. Oh, Juan…. your #10 just has me in tears. Thank you for those words. The commies for this match were brutal. Just brutal. The French crowds have been brutal. Bloggers all over the world refuse to acknowledge how tough Rafa is. To read this from you is soothing medicine. Thank you. Nole will win this tourney in future, there is no doubt in my mind about that. He is one fantastic player, and a deserved number 1. Now, on to final, no? We gonna see, love Ferru and he makes me nervous despite the H2H. What bothers me more than bloggers and media refusing to acknowledge how tough Rafa is is their refusal to acknowledge what a fantastic tennis player he is – how smart he is, how fabulous his movement is, how good his strokes are. He hasn’t compiled his incredible record because he’s lucky or because everybody played badly against him, he’s won because he is one of the most talented players tennis has ever seen. Djokovic has always been more aggressive with his forehand than his backhand. Even in 2009 and 2010, when his backhand “held down the fort,” he would mostly just try to stay consistent and work the point, rather than hit outright winners. People say that the great players know how to win even on bad days; well, that’s what it was for an extended period of time for Djokovic: he just found ways to win even though he wasn’t playing well. In 2011, he started playing more aggressively from both wings, and going for winners off the backhand side. 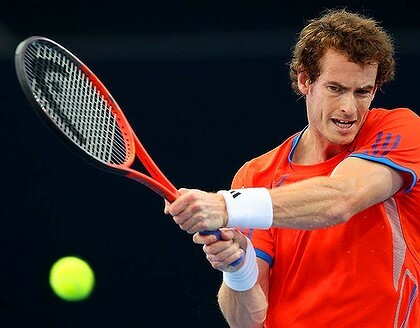 A lot of those winners were very flat, though, because instead of coming over the ball (like Murray here: http://images.theage.com.au/2012/01/07/2878764/art-murray-420×0.jpg), he hit across the ball like Connors (example from this year: https://www.facebook.com/photo.php?fbid=10151642041699920&set=pb.196363369919.-2207520000.1370675725.&type=3&theater). That’s fine if you’re hitting one of Rafa’s forehands and the ball’s over your shoulders, but he developed a bad habit (like you suggested) where he keeps his wrists stable and doesn’t hit through the ball when he’s tight. It’s very hard to consistently hit the ball down the line without a lot of topspin. As for Djokovic claiming that the backhand down the line is his favorite shot: I believe him, but there’s a difference between your favorite shot and your most confident shot. I would probably say that my favorite shot is the backhand down the line too…but I won’t even try it unless I’m hitting my backhand well. It’s a very smooth-feeling shot, and watching it go into the open court and past your opponent is awesome. But a lot of the time I’m much more confident rolling my forehand into either corner. His backhand may be his favorite shot, but contrary to what tennis pundits will tell you, it’s not his best shot, and it’s certainly not his most confident shot. Anyway, great work as always, Juan Jose. This is my first comment on the site, just fyi. I normally am a big fan of your writing, and this is alright, but … the trouble with it is that it reads too much like the rationalisation of a guy who expected Djokovic to win, and is really really shocked that he lost. He would have won, but … bad game plan, maybe bad shoulder, maybe emotionally drained, etc, etc. Many Nadal fans sites can do the same for the Djoko run of 2011, and many would be very true. I won’t go into many specifics, but Wimbledon final 2011 was one of the worst matches Nadal has played at Wimbledon, for example. Also Djokovic’s same fool-proof game plan didn’t work in the Rome and Roland Garros finals of 2012, did it, unless there was also some emotional (let-down) hangover in those matches? In short, I expected more “how the match was won”, and less “why the match was lost”. In short, I think these 2 guys are great, and many of their matches depend on who is playing better on the day. A lot of 2011 it was Djokovic, and a lot of 2012 (or what little of 2012 he played) it was Nadal. Everything else is up in the air. This match reminded me so much of the younger Rafa, and like you said, it was a reminder of just how much of a competitor he is. You nailed it on 10. I’ve not been paying much attention to tennis lately (big surprise) but this match made me happy to see Rafa being himself and just playing his guys out. It was a fun, tense match and kudos to Novak for giving as good as he got. One thing that Djokovic is not, is a true clay player, he should know by now that watering during set is not done and he let his feeling take over… and his concentration was gone. Congratulations to Rafa – you are the #1 clay player in the world. taught and grew up on clay, have followed the sport for decades, been a fan of many players but Rafa simply blows me away. You say it’s his mind you most admire. For me it’s his heart. What you wrote at no. 10 is exactly why Rafa has millions of fans all over the world. Watching him play draws you into the match, makes you feel you’re part of it as you feel invested in every stroke he hits, every burst of joy after hitting a good shot and every disappointment when things go awry. He has so much passion for the game and so much competitive spirit that you can’t help but be completely absorbed in his matches. I’ve never felt like that with any other player, and I’ve been a tennis fan since 1980. I disagree, though, about your incessant theorizing about why Novak lost; he obviously knows that the backhand down the line can be a good weapon to use against Rafa, but he also knows that it didn’t work in the 2012 FO. He knows Rafa must’ve been ready with a game plan to lessen or diffuse the impact of that shot (MC shouldn’t be used as a reference; Rafa himself said he wasn’t playing well throughout the whole tournament, yet he took the 2nd set to a tie breaker so his game was in the ascendancy and, if this were a best of 5 match, who knows what could’ve happened after that). Also, the passing of Novak’s coach was certainly an extra motivation to win and you can see it in the way he willed himself out of trouble as the match progressed. Unfortunately for him, Rafa was even more determined to make a statement and he wasn’t going to be denied. The Rafa of this FO is a version that’s able to take all what the post-improvement Novak has to offer and return it with interest. He should’ve won the match in 4 sets, and he would have but was unlucky that his deciding service game came in the doomed side of the court where strong wind made controlling the ball a tough challenge (all his service breaks were on that side, he said in the post match presser). I trust his luck will change the next time they meet. I find it kind of funny how a lot of the Rafa fans came in here praising your #10, but trying to rationalize that Novak not being at 100% mentally or physically wasn’t a factor. An extremely interesting post, Juan José, thank you. Personally, I find your theorizing of some assumed/presumed (i.e., not based on elements directly related to his tennis game)reasons for Djokovic’s loss a bit excessive, but given that in-depth and thorough analysis of professional tennis is indeed your forte and THE very reason you have been progressively bringing new insights and analytical tools into the tennis landscape over the past eight months, I certainly can “weed off” (as Serena would probably say) what I perceive as being a bit superfluous, if not a bit too much new age for my taste, and thus, have thoroughly enjoyed your post, and am convinced I will keep on thoroughly enjoying your posts, as well as keep on skipping the “a bit too much new age for my taste” parts. I do agree to a large extent with your assertion that the Djokovic/Nadal SF match at RG 2013 was a mirror image of their championship match at the AO 2012, but personally saw this in simpler terms, so to speak, in terms of the players’ respective performances tennis-wise: at AO 2012, Djokovic’s B/H was more reliable, his ROS was more efficient, he was the one playing smarter offensive tennis and displaying astounding mental fortitude over a best of 5 match on his favourite surface, hence Djokovic’s win over Nadal at the AO 2012; at RG 2013, Nadal’s B/H was more reliable, his ROS was more efficient and he was the player playing smarter offensive tennis and displaying astounding mental fortitude over a best of 5 match on his favourite surface, hence Nadal’s win over Djokovic at RG 2013. I do share completely the thoughts you expressed in such VERY NEAT fashion in conclusion to your post: “Rafael Nadal is the greatest tennis player I’ve ever seen. Nobody competes like him. Nobody problem-solves like him. Nobody finds ways to win big matches quite like him. And that, to me, is what tennis is all about: not an aesthetic festival, but a mental and physical challenge.” I would simply add that you’ve probably played, and thoroughly enjoyed, as I have, claycourt tennis and this is partly what has enabled you, and continues to do so, to fully appreciate the somewhat indescriptible beauty, intelligence and greatness of Nadal’s unique tennis game and his exceptional tennis career. Nadal’s forehand DTL, while incredibly effective when well-struck, is hardly his most confident, nor highest-percentage shot. He usually doesn’t hit that shot because it’s not a safe choice for him, most of the time. If you look at the dynamic of their rallies in 2011, Nadal stubbornly continued to hit his forehand CC to Nole’s backhand while Nole just camped on the ad side and ripped his backhand DTL or CC at will. Similarly, Djokovic would hit his forehand CC deep and with pace to Nadal’s backhand, over and over again, knowing Nadal would generally hit a short CC reply or a slice DTL, both easy pickings for him. 1. The fact that Nadal refused to be pinned to his backhand side, by often hitting a deep CC backhand that landed in the deuce corner. Given Nole’s generally-aggressive court positioning, that shot would cause him problems, resulting in an easy short ball for Nadal to take over with. 2. Nadal’s forehand DTL. Djokovic’s dominance in 2011 was predicated on Nadal’s predictability when hitting his forehand. 9 out of 10 times he’d hit his forehand cross-court to Nole’s backhand. What’s more, with diminishing confidence, he was hitting that shot short, landing on the service line. Nole would take an aggressive court position and take that shot on the rise, ripping it cross-court or DTL; it didn’t matter the direction, Nadal was in a losing position at that point. This time he varied his forehand more than I’ve ever seen against Nole. At the most unexpected moments Rafa would hit that curling forehand DTL and Nole, having given up that side of the court to cover the most-likely shot placement, either couldn’t get to the ball in time or hit a short reply, generally losing the point. So I think that rather than Novak employing the wrong strategy (it was the same strategy as in 2011 and we all know how successful that was), Nadal simply adapted his game to prevent Novak from dominating the rallies anymore. For much of the match and definitely on the 5th set, Nadal was playing way out of his comfort zone, taking a much more aggressive than normal court positioning and going for winners. Indeed, when serving for the match at 6-5 in the 4th, after making that error at 30-15, it seems Nadal realized he went for a winner too soon and temporarily reverted back to his “safe zone” of defensive play. Evidently he paid the price. Brilliant analysis, Cec. Agree with your observations and conclusion, which make more sense than the rational expounded upon in the article. Leaving aside the fifth set, I find it interesting that Rafa won the sets (1 and 3) that immediately followed the watering of the court and Nole won those sets (2 and 4) when the court had dried out. I suspect this says less about which court conditions are more favorable to which player and more about how Nole is best served with consistent conditions. Certainly there is a focus issue here for Nole: nearly imploding in the wind of the 2012 US Open Semis; the inability to cope with his family in his early career, the death of his grandfather, the illness of his father, the death of Gencic; and the constant ability to distract himself in his early career. There are myriad ways that Nole requires a “clean” field — whether that field is within his head or is represented by alternating court conditions. We’ve all seen what a fierce competitor Djokovic can be, too. And for all the guff he gets for early fitness issues, this was his 34th consecutive slam, and his 7th time achieving at least a QF here in 8 years. Losing to Rafa had nothing to do with the death of Jelena Gencic – nobody else can beat Rafa in Paris, either. Can we all agree that Nadal presently has no knee problem whatsoever? If that’s a “weak left knee”, everyone should wish for same.